It’s that time of year when the cognac houses come together to donate some magnificent examples of cognac created specifically for the annual La Part des Anges auction. Hosted by the BNIC, every year 25 amazing bottles are auctioned for charities such as the Red Cross. Last year the auction broke all records, with a massive 175,450 euro total raised. The top lot was a jeroboam of Louis XIII, which sold for 32,000 euros. So, what can we expect for 2014? Well, it appears that this year the theme is ‘artful’ cognac bottles. And there are some amazing examples going under the hammer. The highlight of the sale is definitely a Murano glass creation by designer, Philippe Seys. Named ‘Teardrops of Cognac’, the name is a perfect description of this piece of art. 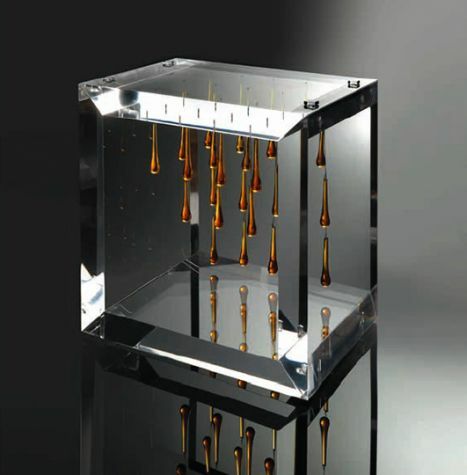 The cube shaped creation depicts tiny tear-shaped crystal containers that the artist says contain the Angels Share of cognac. This is the part of cognac that evaporates during the distillation process, and is said that this proportion is the part that the angels take as their share. An delicate crystal carafe containing one of the rarest and most valuable cognacs every produced by the house. The history behind this cognac is that the founder of the cognac house, Pierre Frapin, selected the blend that was presented a Gold Medal at the Parisian World Fair that year. Only 1,888 of the teardrop shaped bottles were produced. 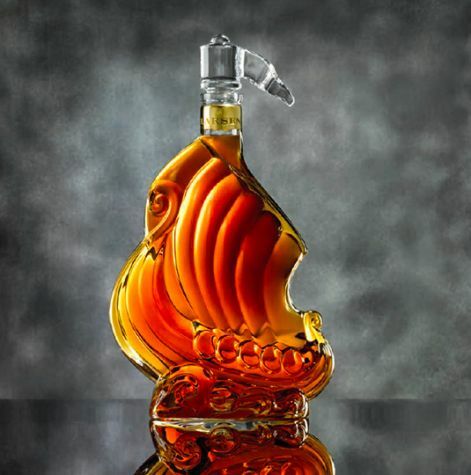 The shape of the bottle was inspired by both the slow ageing process of eaux-de-vie, along with the act of slowly turning cognac in a brand glass. Created by the Cristalleries Royales de Champagne, a 24 carat gold stopper sits proudly on the top, and a gold spiral decorates the side. The decanter nestles in a presentation box next to a cognac glass. There is a base drawer that contains a timepiece that used to be a perfume holder. This scent was specifically created to complement cognac tastings. This Baccarat crystal decanter is a delight to observe, with amazing curves that are reminiscent of a ship’s sails. DEAU have provided an excellent bottle from it’s L.V.O. La Vie en Or series. This is number ‘0’ of the series, created by top Parisian jeweller, Arthus Bertrand. Totally covered in 24 carat gold leaf, he decorated the whole carafe by hand. 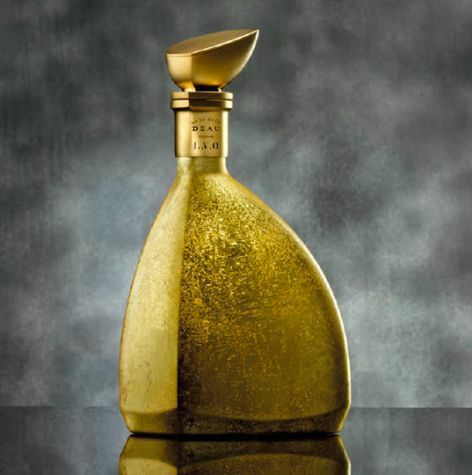 Godet paired with the French sculptor, Romain de Suza to create ‘Assemblage.’ This decanter has been wrapped in gold painted ‘crystal armour’ for an amazing effect. It definitely wouldn’t be an auction without an amazing limited edition of Remy’s famous Louis XIII Black Pearl Cognac. This Baccarat decanter is described by Remy as a ‘black crystal decanter designed like a jewel.’ It takes 20 of Baccarat’s finest artisans to create each of the bottles. 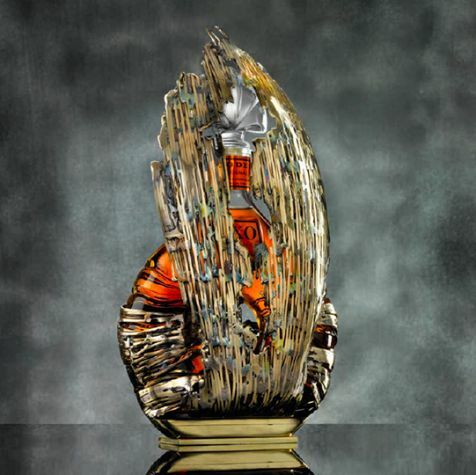 As an addition, the house has also created 100 of the Louis XIII Le Jeroboam. This monster bottle (4 times the capacity of the regular decanter) is produced from an amazing 11 pounds of crystal. The Louis Royer Family Collection is a tribute to Louis Royer, founder of the House in 1853. The three bottles tracing the brand history of Louis Royer Cognac: Réserve Fine Champagne Cognac dates back to the Belle Epoque, while the label of Vieille Fine Champagne Cognac was created between World War I and II, finally the Fine Champagne was designed in the 1950s. We’ll let you know all the details of the auction as soon as it’s happened. Should be a wonderful event.